My favorite late summer flower has started to bloom. Soon they’ll be everywhere in Columbus — at least everywhere that people don’t mow them. They are also known as Hurricane Lilies or Surprise Lilies. They are the Suprise Lilies in the poem of that title in Time Capsules, though I opted for the more general term for the poem. There are other kinds of Surprise Lilies in the South, including a more lily-like pink one that usually shows up in our yard in early August. 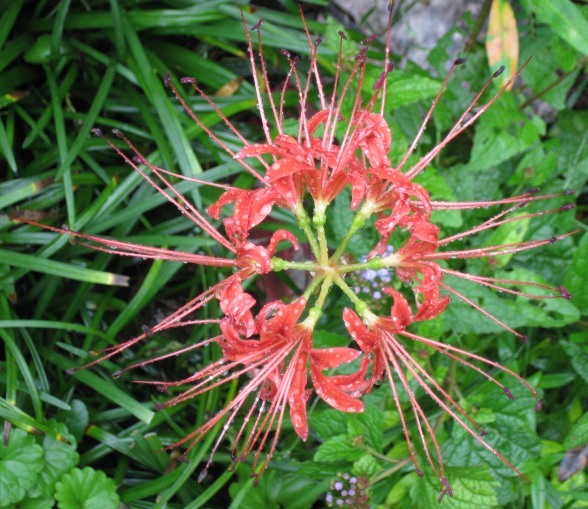 I like Spider Lilies best, though, in part because they always start blooming around my birthday, and in part because they are so alien looking. I had never seen them before moving to Mississippi, and I’m always fascinated with plants that are endemic to a region. This interest probably started when I lived in Austin, Texas, and learned about Bluebonnets. Lady Bird Johnson’s Wildflower Center was a big influence at the time, as well. 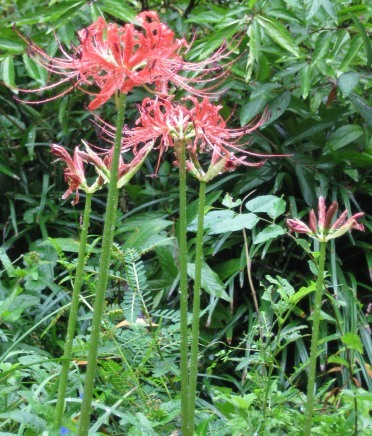 This Spider Lily (I see there are other flowers with that name as well) sprouts a single stalk that then puts out the very fringed petals from several sepals that radiate from the central stem. Only later, after the blossom has died back does the bulb sprout green leaves. I try to mow around these to encourage new growth, so we usually have quite a few in our yard. It is always fun to see where they will come up and how many we’ll have each year. The Spider Lily is a sign of cooler weather to come, and they usually sprout after a rain, like the thunderstorms we’ve had this week. I took these pictures this morning out by the pond beside our back patio. There are a few more coming up in the side yard, and I hope in week or two there will be many more in the front yard as well. One house on our street usually has a whole row of them all along their property between the sidewalk and the street. Can you tell I’m a little jealous? But theirs haven’t started to bloom yet, so at least we have some of ours first!